Are you shopping around for the best RV converter? This special device can help in delivering power to your appliances and electronics onboard for its ability to supply clean and safe DC power to them. However, we recognize it’s not an easy process to choose one. There are many of these products on the market now, offering different features and having different prices. For this reason, we have put up a shopping guide and reviews to help you in the selection process. In the following, let’s talk about the things to look for, including type of converter and its maintenance aspect. Let us also answer some of the most frequently asked questions about RV converters. If you’re ready, let’s begin. 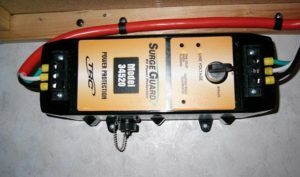 One of the most dependable RV converters I found online is the PM3-55. It will be worth your money for its great features and durability. This product can give you the most value of your investment because it is advanced and versatile for its many uses. You can rely on it to work when you need it and won’t have to worry about RV converter fan not working issues for a longer time because of its durability. 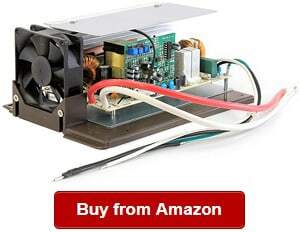 The product can offer a great solution whenever you need a good power supply. One of the things I appreciate about this converter is that it is highly useful whenever you need a good power supply. One of the things I also like about the Powermax is that it can give you a reliable source of DC power whenever required in the campsite or anywhere you are. The charge can offer clean DC supply of power for your RV so that you can experience the convenience of using electronics and electrical appliances in your recreational vehicle. You can also rely on it because it doesn’t require any battery. However, you can use it with a battery, too. The converter is also able to work with all sizes and types of recreational vehicles, campers and travel trailers as long as it is requiring 12V DC power with high amperage. I also liked that it offers an easy installation process. It is one of the best features of this product that you should be looking for when buying a new or RV power converter replacement. When shopping around, you might want to consider this one because it won’t give you a headache in setting it up. The kit already comes with mounting flanges and AC power cord. Another thing I liked about this converter is that it does not interfere with signals from a radio or television, among others. You will also like that it is designed with safety features. The Powermax model has current limiting function, shutting power down when there is an electrical overload or short circuits. The only problem I found here is its quite noisy operation. The WFCO WF-9855 is one of the most reliable power converters to use in your travel trailer, mobile home or recreational vehicle because of its heavy-duty design and construction. 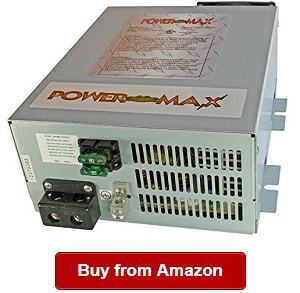 I would like to recommend this product because of its ability of supplying clean and reliable power for your RV electronics and appliances when needed. You can also rely on the power converter because it is easy to operate. You don’t have to any filtering from a battery to provide direct current power to your recreational vehicle or travel trailer. This converter is also one of the best in the category because RV owners can also choose from different sizes. For this reason, they can upgrade or replace the old converter battery charger or a defective or obsolete mount converter. 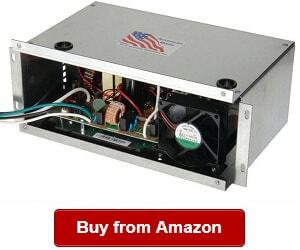 The DC converter can also be your reliable choice when it comes to upgrading your old system. For example, you can just replace a single-stage converter that isn’t as efficient as this 3-stage power converter. WFCO is also impressive for the design and operation of this unit. The model can operate quietly while running efficiently in providing clean and pure DC power that won’t damage your electrical appliances and electronics. Aside from offering quiet operation, it is also a dependable converter that can stay cool for its built-in cooling fan, which also has the ability of running only when needed. When shopping around for a power converter, you must also look for one that isn’t interfering with the signals on your recreational vehicle, including those generated by televisions and radios. I also would like to recommend it for its ability of keeping battery life for its automatic battery charging function. It also has safety features, including its current limiting function. With it, you can have peace of mind that it will shut down the power automatically during an electrical overload and short circuit. The only problem I have with this one is that it can be quite pricier than other products in the same category are. The Progressive Dynamics PD9260CV is one of the most durable and reliable DC converter for your camper, truck or travel trailer. It is versatile enough that you can use it for these vehicles. It also comes in different sizes that you can choose from. When looking for a converter that won’t give you a hard time in troubleshooting RV electrical problems especially when you need clean and reliable DC power in your RV, you might want to take a look at the Inteli-Power 9200 Converter. 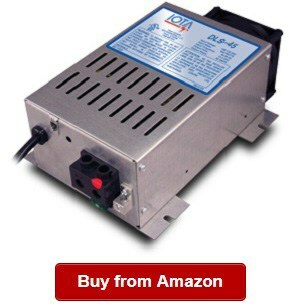 It is an impressive converter that is able to deliver consistent filtered power to the appliances, electronics and lighting circuits in your camper or travel trailer. When it comes to RV converter installation, you also don’t have to worry because it is easy to setup. You won’t have to spend so much time and effort in installing it to your recreational vehicle. The device also has the ability of delivering safe and rapid battery recharging. In addition, this device also has that ability of preventing any possible damage for its reverse battery protection features that can prevent improper lead connection. There are also several sizes to choose from the power converter. For this reason, you might be able to find the right DC converter for your vehicle when you choose Progressive Dynamics. Another thing I liked about this model is that it has a charger wizard. How does it work? It pertains to a system, which is controlled by a microprocessor that is there to monitor the voltage in your battery all the time. As a result, your battery will be recharged quickly and safely. When there is low voltage issues, your RV electronics and appliances will be protected by this device. Thanks to the low voltage protection feature of the converter. This feature also works by automatically lessening the output voltage when it reaches the max capacity due to its current limiting function. The converter also gives you the opportunity of choosing from three different charging voltages. There are also four operating modes in the system, so you can choose one based on the battery’s condition and use. When it comes to durability, you can also rely on the converter because of its protective features that keep the device safe. On the downside, the converter has some noise issues due to its fan. If you’re worried about RV converter troubleshooting, you should not when you select the DLS-55 Power Converter/Battery Charger. It is one of the most reliable in the category for its top performance of being able to deliver safe and clean DC power to your RV electronics and appliances. 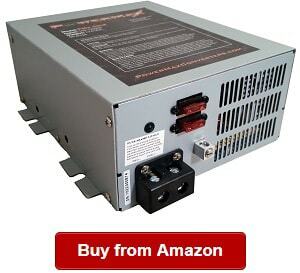 Whenever you need direct current power, it will deliver for its quick and easy operation. This model from IOTA Engineering can convert 108-132 AC into up to 13.4 volts DC, and this is for both the 12V battery charging and load operation. It is also reliable in operation. Working as a power supply, this unit has controlled regulation that can let you operate using nominal 12V direct current into 55 amps. Using it as a battery charger, you can count on the unit that can keep your battery in good condition for delivering its total current when its capacity is very low. When it comes to a reliable operation, another thing to appreciate about the unit is that the voltage is set to provide its max current for a time period in order to limit the unnecessary stress to the battery because of its cells’ heating. This function can ensure that the battery will last longer and stay efficient. In addition, the DLS 55 can automatically drop the current as the battery is nearing its full capacity. 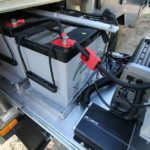 In this case, there will be a float-charge going to the RV’s battery, preventing the cells’ self-discharging. When it comes to ease of installation, you can rest assured that you won’t have to spend so much effort and time in setting it up. You can use it within minutes. That’s one thing that makes the unit a part of this top list. This product also has a low operating temperature, making it more dependable when it comes to efficiency. In addition, you can make use of the unit with the IOTA IQ4 charge controller. Another thing I liked about the unit is that it can fit different sizes of mobile homes, campers and recreational vehicles. It is also by a top brand known for intelligent engineering and construction. It continues to impress RV owners for the high performance of their converters. On a downside, the IOTA unit is a bit more expensive than other models on the market are. The WF-8955-MBA 55 DC amp is one of the top choices among RV owners who want to make use of a long-lasting and dependable converter for their recreational vehicle, camper, and mobile home or travel trailer. The Arterra WF-8955-MBA is also one of the best in the category as a part of my top recommendations. One of the things that impress me about this RV DC converter is its automatic three-stage charging system. I also liked that it has a power input totaling up to 950 watts. In addition, the converter also offers us good investment for its versatility. It is able to handle the charging requirements of your vehicle. Aside from its versatility, this unit is also able to extend your vehicle battery’s lifespan, meaning your batteries will stay on top peak condition for a longer time. I am also impressed that the unit can fit tight spaces for its small and compact size. 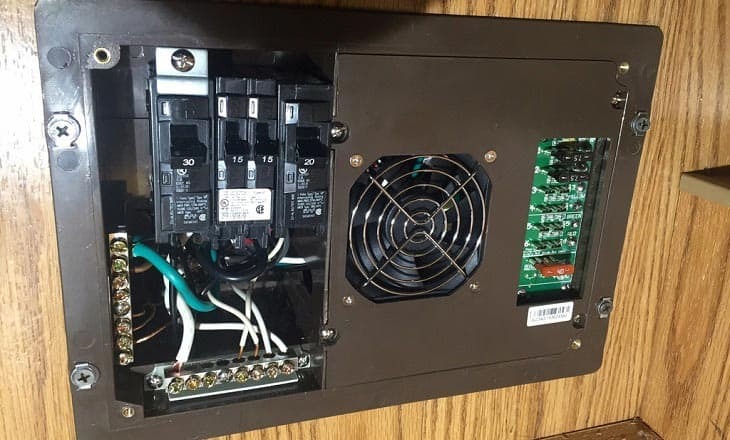 You also don’t have to worry about the installation process because it only takes minutes to set up the RV DC converter that you can use right away when it comes to providing clean and pure DC power to your electronics and appliances. When it comes to installation, you only have to use two DC wires, three pieces of AC wires and two pieces of screws. It will let you install the unit in minutes. You can also choose it if you’re looking for a good replacement for the power centers in your rig. I also find that this unit is a top performer even if it is not that expensive as other models on the market are. 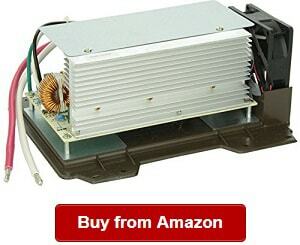 The converter can also work well to solve any 12V fluctuation issues. I also liked the simple design of this product that makes it very easy to use. On the negative side, the unit is a bit loud in operation. The PowerMax PM4 is one of the most versatile RV DC converters on the market for its top performance and increased durability for its solid design and heavy-duty materials. It is one of those units that leave a good impression on me because of its ability of supplying clean DC power to your rig’s electronics and electrical appliances whenever you need DC power. You can also rely on the battery charger when it comes to clean and safe DC power to your rig. With that said, you can have peace of mind that your appliances and electronics will be damaged. This unit comes with an integrated smart charger. You can also easily plug the unit into a regular 110 V or 120 V AC outlets that has a DC output. You can just use a setscrew style terminal (+,-, grounding lug) when needed. You will also like that this is a smart unit that has a top performing charger that can control output between charge rates of bulk, 14.7V; absorption, 13.8V and float, 13.2 V. This unit is also good for having a reverse polarity protection. When it comes to quality, you can also rest assured that the unit meets standards, assuring users that it will last long and perform well. This product is approved by both CUL and UL. I am also impressed that the unit has a powerful integrated four-stage smart charger, which can charge your vehicle’s battery safely, effectively and quickly. In addition, the power converter is also very reliable when it comes to delivering 55 amps DC power output to your appliances and electronics. You also don’t have to worry about fluctuating power output because this unit can deliver consistent, clean power. On a negative note, this product can be hard to install for beginners. 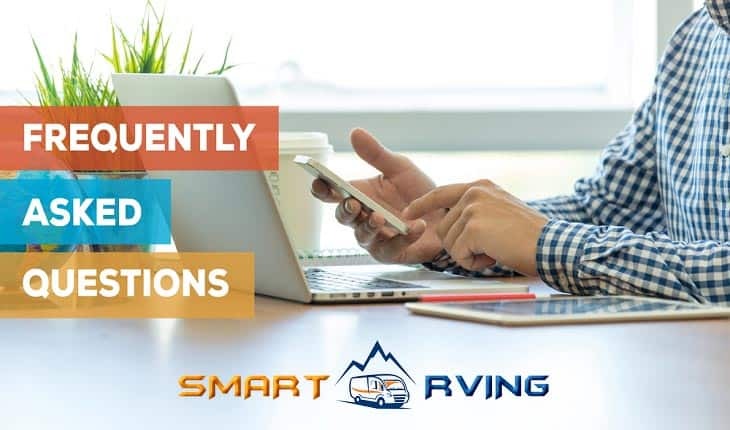 Nevertheless, it has the smart functions and features that make it a decent choice among RV owners looking for a durable and reliable converter to last long. Are you looking for tough and smart best RV converter upgrade for the lower section? Then, you might not have to look any further when you have the Replacement Power Center that will help you have clean and pure DC power to your appliances and electronics, giving you peace of mind that power will be consistently available whenever you are camping or on the road. 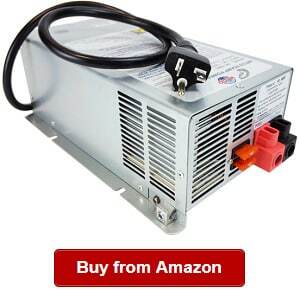 The Parallax power supply is also one of the most reliable to have around because it is made of heavy-duty and sturdy materials that make it a top quality choice among recreational vehicle owners looking to use a reliable power supply center replacement section for their rig even for replacement or upgrade of their outdated power center. It is one of those that leave me a good impression because of its tough features that make it a powerful contender to be one of the best on the market now. 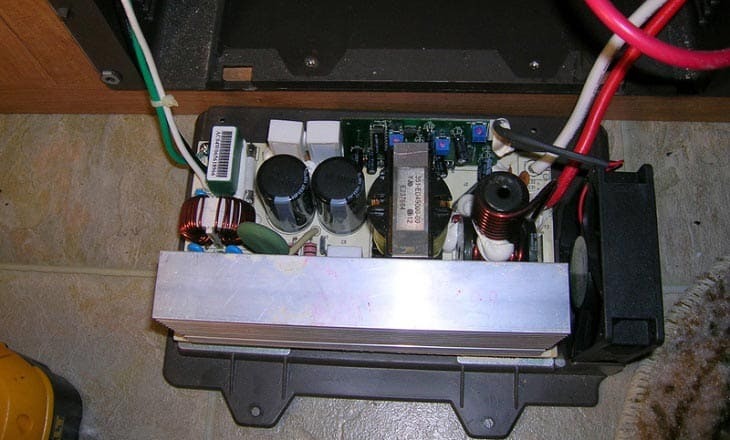 The Parallax Power Supply 55 Amp offers an easy direct lower section replacement. You also don’t have to worry about installation because it is a breeze to do it. I also liked that it is lightweight at only 4.3 lbs, ideal for the recreational vehicle because it won’t add much weight to the rig. It also has a compact and small footprint for its relatively small size of 9.5 x 7 x 4 inch (LDH). Where space is a premium like tight RV spaces, you can be sure that this unit won’t consume much of it in your rig. This replacement section for WF-8955, WFCO WF-8945 and Model 7155 is also made of heavy-duty materials, giving you peace of mind that you can maximize the value of your investment when you choose this replacement section for those mentioned models. On a little issue, this unit is a bit pricey versus others on the market is. This unit is a part of the Inteli-Power 4600 Series that the brand has introduced to the market for their consumers looking for top quality converters. One of the most impressive features of the Progressive Dynamics PD4655V is the integrated charge wizard in the design, which aids in increasing the battery life. This converter is an ideal upgrade to your old or obsolete power chargers or converters. It is not hard to install at all, and all you need are a few minutes to get the job done. So if you’re looking to upgrade an old system, you might not have to look further but might want to take a look at the Power Dynamics converter that can deliver up to 55-amp output. If you’re always on the road, you should choose a reliable power converter like this unit that can offer clean and safe filtered DC power to your 12V lighting circuits and appliances. It is a decent choice when it comes to safe and rapid charging of your RV batteries. You don’t to worry about unsafe charging because this one comes with a charge wizard. What does it mean? It pertains to system that is being controlled by a microprocessor. It also functions to keep the tracking of the battery voltage. In addition, the charge wizard can also make sure that your RV battery will be charged safely and quickly. This model also comes with four different operation modes that you can easily choose from based on the use and condition of the battery. On a negative note, the unit can be a bit noisy to operate. When shopping around for a DC power converter, you should look for a reliable brand that is offering reliable and heavy-duty converters/chargers. One of those impressive units I found is the GPC 55 MAX converter that is indeed one of the best in the category for its valuable features. The charger and converter will supply power to your rig and charge your battery quickly and safely. You can also rely on its increased efficiency for its four-stage charging system. This unit can handle up to six batteries. It can handle different battery banks at the same time. This converter is also available in many sizes, so you can choose one that can fit your rig. In addition, this unit is one of the most flexible to find on the market. The unit also has a compact design, allowing you to install and fit it in your RV. You can rely on it that it can fit even in very tight spaces. It also includes a 15-amp plug. This product also has a great design. The multiple batteries being charged on the unit will be charged at different levels. So if there is a battery charged, all the others will be charged at multiple levels. It has a smart feature that lets you equalize the stages of the charging system. The unit can also make sure that batteries are charged at a higher than normal voltage. It is a great function to ensure that the batteries will have similar charge levels. And when it comes to the equalize stage, it can also work automatically whenever a battery bank requires it, offering you with top convenience. I also liked that the converter comes with a 15A male plug, allowing for easier installation. In addition, you can have peace of mind that it will be compact to fit even in a small RV space. When it comes to quality and safety, you can be certain that the mode is UL listed. On a drawback, this unit is operating with noise, which can also be the problem for other RV DC power converter. The WFCO power center is one of the top choices on the market when it comes to reliable RV converters and chargers. You can have peace of mind that this power center is efficient and reliable whenever you need power supply to your appliances and electronics. When shopping around for a good RV power converter, you can choose the WFCO unit for its ability of supplying 35 amp of direct current output to your electrical appliances onboard your vehicle. Another thing that impresses me about the power center is its ability of working with or without a battery. 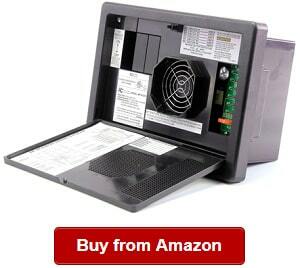 It is also convenient to use because you won’t need an additional filtering to keep it operating and running. I also liked that the converter is fully automatic, making it convenient to use for RV owners looking for an efficient unit that can run without much maintenance required. The unit also offers a three-stage charging system, promoting and extending longer battery life. You can also be certain that you can erase your worries because this converter also offers short circuit protection and reverse polarity protection. It can give you peace of mind that it is safe and dependable to use. The unit also has a built-in cooling fan, which can keep the system cool, lowering its risk of damage. In addition, the fan will only work when needed. You can be sure that it will also promote a silent operation. This cooling fan doesn’t also require additional space in the recreational vehicle. When it comes to protection features, the converter also features protection from issues, including over temperature, overload, over current and short circuits. In addition, this charger/converter won’t interfere with any signals on your rig, including television and radio. On a drawback, this unit is lacking clear installation instructions that might be a challenge especially for first time users. It also has lower number of stages in its charging system. The Power Center Converter Charger is yours if you want to replace RV converter battery charger for its solid and powerful features. This WF-8900 series converter offers excellent performance, offering you with top convenience and reliability. The WF-8900 is a part of the series from the brand known for its supreme performance whenever you need clean and safe DC power to your rig. The charger/converter is offering 55 amperes DC power. You can rely on it if you’re looking to replace an old Parallax part #7355, Atwood part #APS5530 or Elixir part #ELX60. This is a good choice because it also comes with different safety and protection features, including reverse polarity, over current, overload, short circuit or over temperature. Having these features integrated on the WFCO WF8955PECB, you can have peace of mind that potential issues can be prevented. It is also to make sure that the device is able to keep your electronics and appliances safe from damage. This product is designed with two pieces of 30A fuse positions on the fuse boards. With such a good design, you can also rest assured that you won’t meet any hassle in operating the device. I also liked that it offers easy and quick installation. With that said, you don’t need to worry that it would give you a hard time to set it up on your rig. It is one of the essential features to look for when shopping around for an RV converter replacement or new installation. 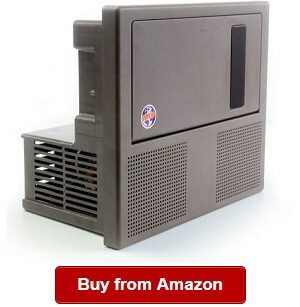 This product is also compact and has a small footprint. You can set it up without worrying that it will take up much space. It has overall dimensions of 2-3/16 x 10-7/8 x 7-1/4 inch (WHD). On a drawback, this unit is pricey. The 8900 Series power converter can be what you’re looking for if you need the best RV power converter. It has smart and solid features and functions that will give you peace of mind that you’re using a good DC power converter for your rig and the onboard appliances and electronics. This unit is able to convert 105-130 V alternating current into 13.2-14.4 V direct current power that will help in supplying power to appliances operating in this range. You can also count on it for being able to replace a lower power section if you have one belonging in the WF-8955 converter series. The converter is also able to install using only two pieces of screws, two DC wires and three AC wires. When it comes to safety, the Stag 8955-MBA is also a top contender for the high quality RV converters on the market now. It comes with different protection and safety features, including reverse polarity, short circuit and over current. In addition, it has over voltage and over temperature feature. All these things can give you peace of mind that the electronic and electrical devices will be protected from potential issues that might arise. You definitely need a good converter like this one on your rig if you want to protect your valuable investment from damage due to electricity fluctuations, which are sometimes a concern. You will need a converter like this one that can work smartly to protect your appliances from damage that would otherwise cost much money. This unit also comes with a battery charger that makes it an ideal choice for RV owners looking to use a versatile product to work as both a converter and a charger. The charger can recharge your batteries quickly and safely. On a negative note, it has no thermal protection. While there are many RV info and guide sources on the web, Smart RVing is unique for our process of evaluating, testing and reviewing the RV products and gears that we’re featuring here. For one, we determine and weigh in the factors to look into when buying a specific RV product, such as the best portable RV generators. We check on the considerations in order for us to make a thorough review of each product featured. 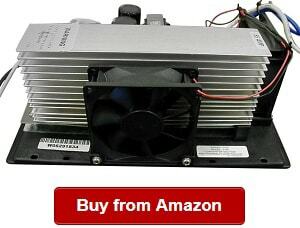 Our reviewers then conduct the review of each power converter so that you can come up with a good buying decision later. We have also weighed the pros and cons of each product so that you can compare your choices better. The top products we’ve featured today also top-rated ones on customer reviews and ecommerce sites. Our reviewers have also picked converters made by the best brands to ensure of their high quality and heavy-duty features. Most of them are also smart converters with automatic functions to add to the convenience of use. 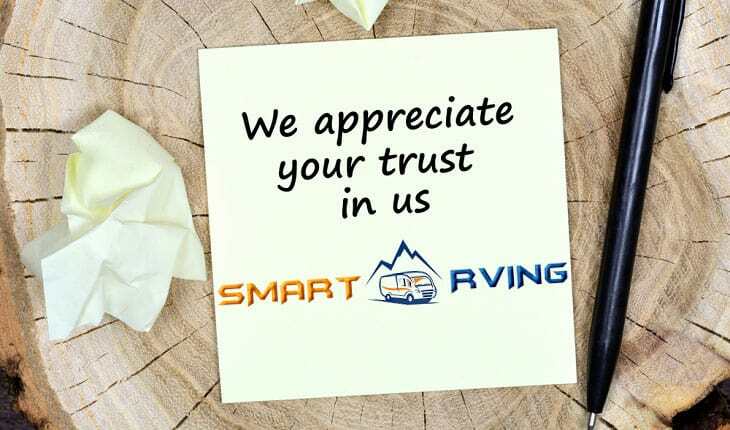 Nevertheless, we’re serious and committed to provide you with a comprehensive shopping guide and reviews so that you can maximize your investment with a durable and high quality converter that can deliver clean and safe power to your RV appliances and electronics. What is the best converter for RV? It is an especially designed device that works by converting 110-volt alternating current into 12-volt direct current power, which is used in recreational vehicles. This device can also be used in charging the battery of the vehicle. Then, a converter charger is needed in recharging the batteries when your rig is plugged running off a generator, which does not have a 12V charging port or it is plugged into the grid. Take note, however, an RV converter is different from the best RV inverter, which works by converting DC power output into an AC power. On the other hand, the converter functions by converting AC power into DC power based on the RV’s voltage used. These compact and small devices are convenient to install and use. In fact, they can be positioned in hidden places in the vehicle. They are also quiet and efficient – thanks to the innovative design and construction of the best manufacturers. This unit is also working automatically whenever the rig is plugged or connected to a shore power or whenever the generator is turned on. As mentioned, converters turn 120V AC into 12V DC in order to run various electronics and appliances onboard except draining your battery. These units also keep the battery charged, prolonging their lifespan and saving you money. There are types of converters to choose from and install in your rig, which is why you have to consider them well before replacing, upgrading or installing a new one. One is the mounted power converter. The other is the distribution panel converter. The mounted converter is easy to install. You just have to screw it in place using screws in order to fit it on the floor or sidewall. On the other hand, you can also install it anywhere convenient provided it is fit, such as under a seat or inside a compartment. Also, you can position it anywhere you can reposition the source of the incoming power supply. Then, there is the distribution panel, which is chosen by those looking to replace an old system. The large panel unit can be positioned in a cutout wall, where you can easily access it. This type usually has fuses and circuit breakers to find on the main panel’s door. There you have the two types of converters that you have to consider carefully if you’re shopping for a new or replacement converter. Weigh your options well and choose one that suits your requirements. You should also know that you must choose one with the correct amp so that your appliances and electronics will run optimally. And in all cases, you should also check the number of amps, brand and model number. One of the best ways to start is to check out our top picks RV converters above. 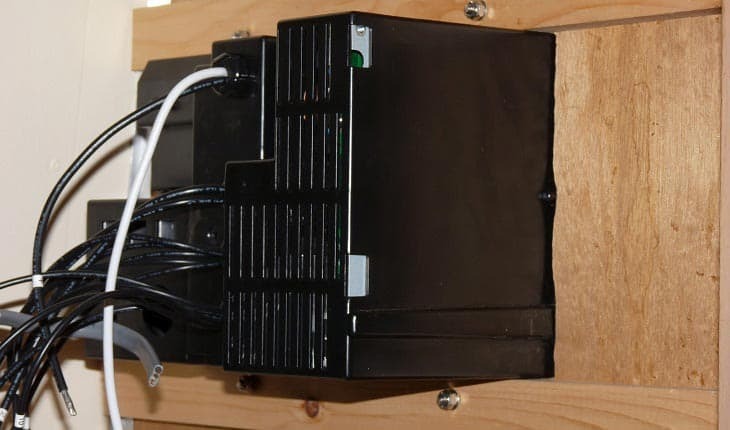 Whether you’re looking for an RV converter replacement or a new installation, know that there are certain benefits to using a converter charger for your rig. For one, these devices are perfect in keeping the batteries in your rig charged at least partially. Thus, you prevent them from draining. These units charge onboard cells regardless of the power source. However, you must pick a versatile one that can work no matter the available power. You can also rely on the converter all the time because it can ensure that your batteries are charged, allowing you to experience convenience for being able to use your onboard appliances anytime. Many of the best ones can also work by recharging your vehicle’s batteries, electronic devices and car battery. A good converter can also prolong the life of your battery because it can keep the batteries charged, while allowing you to run the rig using any other power source. 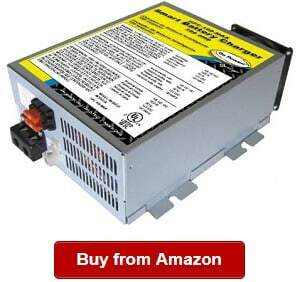 In addition, a good converter can help in delivering clean and safe electrical appliances. That said you could prevent their damage and spending on repairs. You can also have peace of mind that they will be supplied with adequate amperage that will keep them running optimally. With an RV converter, you can also ensure that your precious investments won’t be damaged due to electricity fluctuations and issues, including overload, over current, over temperature and reverse polarity. A smart converter has automatic features that can shut down the power going to your appliances when it detects an irregular electrical supply. Before shopping for one, you must also know the things to look for or features to consider so that you can maximize its use and benefits. A trickle charger might not be for you if you’re looking for a fast charger. On the other hand, those high-wattage battery chargers can save you charging time, but then it can cause stress to the battery. At worst, your battery might also explode. So as an advice, you should pick a converter charger that can recharge your batteries safely if you’re looking for a deep cycle charging done effectively and safely. In short, you must find a charger that attends to the specific task for which you’re buying it. Another consideration when shopping around for a converter is its amperage. You should take note of it when selecting one to buy. There are specific models designed with 45 amps or 55 amps or maybe higher. How closely should you be monitoring the batteries? Do you want to set and forget about the converter charger? For that, you might want to consider an RV converter charger to work that way. You might also consider a smart charger that will not cause explosion of the battery due to overcharging. 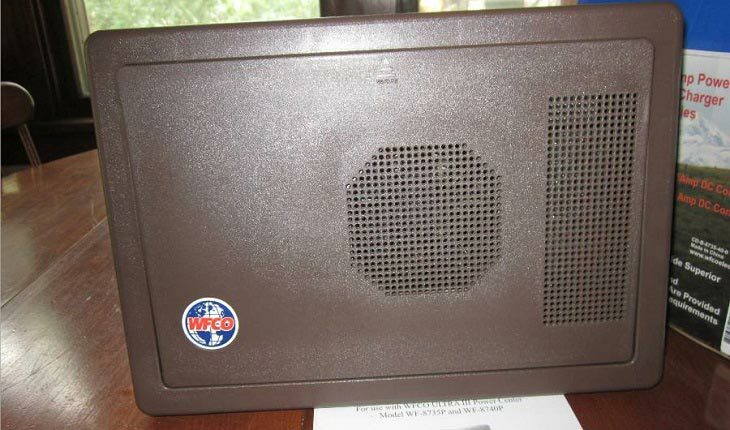 There are some units on the market that work quit noisily due to their integrated cooling fans. Some of them only work when needed. Nevertheless, you should check how noisy they are by reading reviews from other customers using the same model on which you’re eyeing. However, noise might not be an issue if you’re installing it outside your rig. 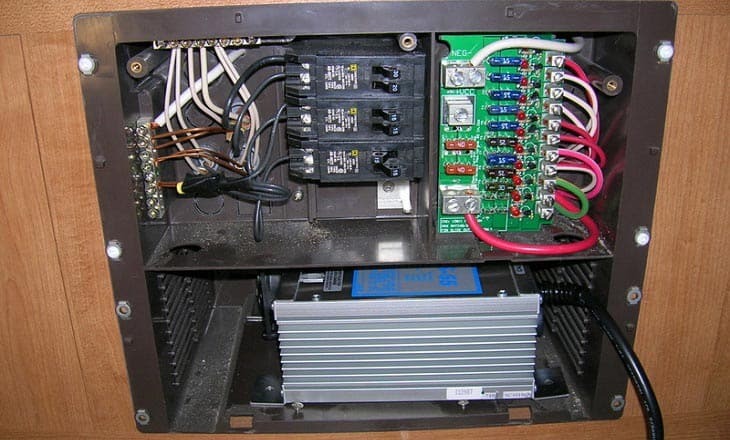 When shopping around for a converter upgrade, replacement or new installation, you should not just check the RV converter wiring diagram to understand how the system works but also the maintenance. For example, how hard or easy it would be to replace the converter’s fan. Are converter chargers integrated into your rig or should you buy one separately? Know how to install one in your recreational vehicle if you don’t have a converter charger built into your RV. Next, you have to check on the space available where you plan to install it. The best models on the market now are compact and small in size, making them suitable even for tight RV spaces. Also, check if you can wire it into the electrical system of your rig without any problems. There are standalone units that can be easy and quick to plug or connect to your batteries and to the grid. But aside from ease of installation, know the kind of accessories and tools required to set it up. Speaking of tools and accessories, many of the best picks featured above are complete with the cables, built-in charger and instruction manual to install. Before buying a converter, determine the type of batteries you’re using. Are they lead-acid batteries? Are they lithium ion batteries? Are they AGM? Take note of that to find the right converter that suits your needs and to ensure that it will work. In addition, know the kind of battery you can actually use. If you’re camping in freezing places, know that Li-ion batteries won’t be charged below freezing temperatures even if their electrolyte is in good condition. Q: What are good RV converter brands? A: There are many brands for an RV converter. In today’s review, we have featured the best of them, including Powermax, WFCO, Progressive Dynamics, IOTA Engineering, Arterra, Parallax, Go Power and Stag. You can weigh your options and select the best one based on the functions and features you deem important. 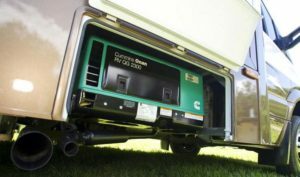 Q: What size RV converter do I need? A: Size is another factor to consider when buying an RV converter. That is why you have to figure out what size you have to buy. At the very least, it will depend on the onboard appliances and electronics and their power requirements. You should determine the kind of appliances you’re looking to operate within a time period. You should also check their continuous and surge power ratings. In this case, you must ensure that the continuous power rating will be high enough so that it can handle the loads that you have to run at the same time. You must also see to it that what you’re buying will be based on the appliances’ watts and amps that you will run. In addition, the converter should be able to accommodate the surge of the loads that will start simultaneously. Q: Does it with a cover? A: If you’re asking about its housing or case, many of them do have a cover to protect the components inside it. It will also ensure that they are protected from the elements. A: The warranty isn’t the same across converter brands, models and manufacturers. In many cases, we found brands offering from one to five years of warranty. However, the coverage of those warranties isn’t really the same among each of them. For example, there can be a year warranty on the parts or a year for the labor. It depends on the specific maker and their procedures. Q: How to install RV converter? A: The installation process is easy! You just have to follow the specific instructions from the manufacturer on the converter that you bought. Some of them only require screws for mounting. Nevertheless, you can check the installation instructions of the maker. Q: How to test RV converter? A: There are some ways to do it. For one, you can check the entry point of where the 120V power is located on your rig so that you can verify that the converter charger is receiving the power. Then, you can start plugging your vehicle into a working generator. Next, you have to check the reading that must be about 103-130 AC. Checking the reading, you can prevent damage to your appliances and devices. If the reading goes beyond 120V, your appliances might be damaged. There can also be more electrical problems that might arise from it. Q: How to tell if RV converter is bad? 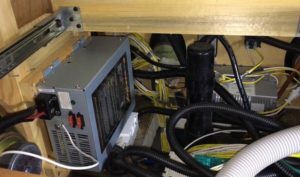 A: So, you need RV power converter troubleshooting? If you want to figure out if the converter is delivering poor performance, you should check for certain signs. But in general, the converter is bad if it stops working altogether, leading to power loss to your 12V DC fixtures or controls. You can also tell that the converter goes bad if it is unable to run electronics even if it is supplying power. 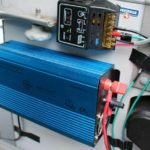 Q: How to replace an RV power converter? A: The only thing for you is to buy a reliable converter that can fit your needs, and then you just need to follow a quick and easy installation process. Compare the options above and pick the right converter charger for your rig. We’re hoping that we’ve shed light on how to pick the best RV converter for your rig. 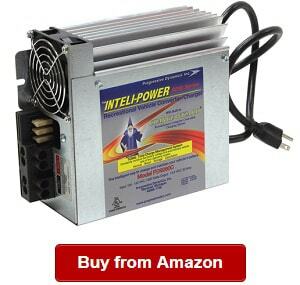 Again, consider the short buying guide on the factors to look into when buying this power converter. From there, you can compare your options on the top picks in the category that we’ve featured today. 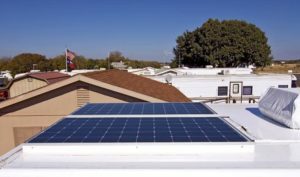 If you’re looking for other products in RV power and electrical supplies, then we suggest going for these articles: best RV inverters, best RV inverters, best RV surge protectors, best RV solar panels and best RV batteries. We do hope you find them useful. Thanks!